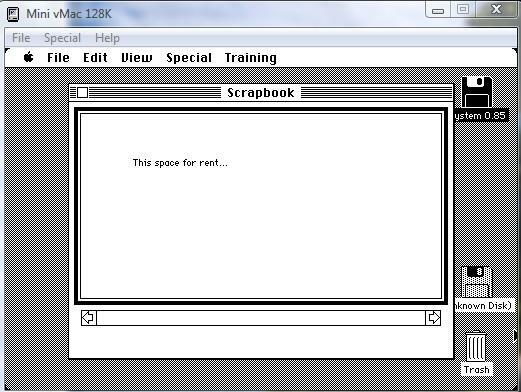 I have decided to upload my collection of Macintosh abandonware, all the way from Mac OS 1.1 to OS X 10.2 and OS X Server 1.0. I know some of you have asked for OSX stuff, but considering the age of some newer OSX releases I will only release up to 10.2... for now. Once Snow Leopard (10.5) is released I will send up 10.3 as well. 10.4 is still too new to be considered abandoned, same goes with OSX Server 1.1 and newer. The list will change before the final release onto the FTP, some releases might be added, some might be removed. These are as named on my server, but I will rename them to fit BA standards. If anyone has any issues regarding this, or if anyone has any releases I don't have please contact me so I can add them to the collection. It will take some time before I make this release (got tons of Win7 to upload among other stuff), so there's plenty of time for additions. They are modifications of retail OSX builds, all of them meant primarily to go around the machine protection system Apple included to prevent OSX running on non-Apple hardware, secondarily to add custom/hacked drivers to allow OSX to run on hardware Apple never intended OSX to run on. We don't add warez, and absolutely not cracked ones. They are custom modifications. Period. We don't add hacks and modifications regardless of how unique they are, none of them are originals from the company that made the OS. If Microsoft made a "hack" of Windows we would add it. If you made one we won't. *drool! * Oh my, I think I'm in heaven! Thank you so very much! Thank you so much mrpijey, it's much appreciated. Thanks, would love to see some of the earlier versions, there isn't much on them. On another note, has anyone every seen a copy of Mac OS 5 it was released, albeit for a short time, about a year, yet it is almost nonexistant, I've never seen 1 copy on ebay or anywhere. From what I remember elder OSes don't work on x86, but on PowerPC. Is it correct? 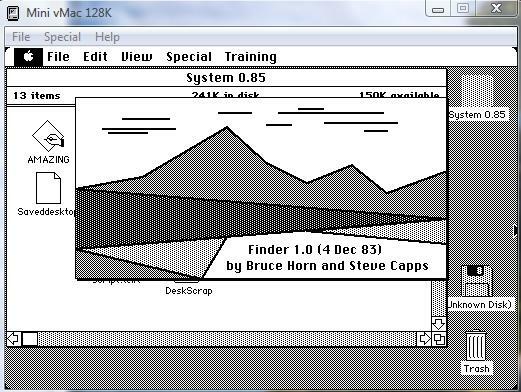 Yes you are indeed correct, the elder Mac OSes ran on 68k (Up to Mac OS 8.1) and on PowerPC. On another note, has anyone every seen a copy of Mac OS 5 it was released, albeit for a short time, about a year, yet it is almost nonexistant, I've never seen 1 copy on ebay or anywhere. At least I assume these are Mac OS 5.0, it was somewhat confusing that the System and Finder had different version numbers back in these days and both version numbers were given - apparently 5.0 was the first to have a unified version number but then according to MacTracker 5.0 had System 4.2 and Finder 6.0, very confusing - I assume this set of disks is therefore what we would call "Mac OS 5.0". About the Finder, dated around a month before OS 1.0 and the original Macintosh became available. 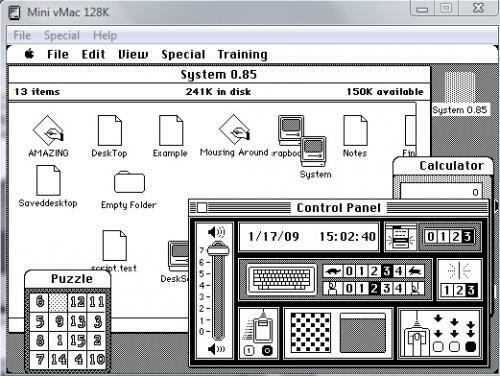 Note the Mac icons show a 5.25" drive on the front of them, whereas all released Macs had 3.5" drives. The Scrapbook application - in OS 1.0 this had some text on the first page telling you how to use it, and there were a few sample images on the next few pages. Yeah, looks great! Would it be possible for an upload to complete the collection further? Quoting myself here... After doing some lurking on my harddrive I actually found System 5.0 and 5.1. I have no means to verify them at the moment, but I will add them to the collection. If any of you find them to be wrongfully labeled then I'll adjust the release. Only one I can think of is PearPC, but it's slow and development has stopped. Never tried to run 10.2 on it tho. I know 10.3 and 10.4 works on it. 10.2 does work on PearPC, I tried it. I think it would work. I've tried 10.1 on PearPC and it works fine. Couldn't get the internet working, however. Thanks for the upload, mrpijey! Once Snow Leopard (10.5) is released I will send up 10.3 as well. 10.4 is still too new to be considered abandoned, same goes with OSX Server 1.1 and newer. I don't mean to nitpick, but Snow Leopard is 10.6. Yeah, a small typo . I've tried 10.1 on PearPC and it works fine. Couldn't get the internet working, however. 10.1 is the oldest one that will run on pearPC, yes. I did have the internet working on an old PC a few years ago with 10.4 and it should be the same for old versions but it isn't particulr easy, you have to install an "OpenVPN" network driver on the host machine and it goes through that, there should be some instructions around somewhere - I haven't bothered to set it up since though. 10.2 client works; however I seem to remember trying 10.2 Server and it crashing before it was fully installed. PearPC seems more fussy about the server editions for some reason; 10.3 Server works but 10.2 and 10.4 don't seem to, and I haven't yet found a copy of 10.1 Server to try with. All the Mac OS abandonware has been released now. 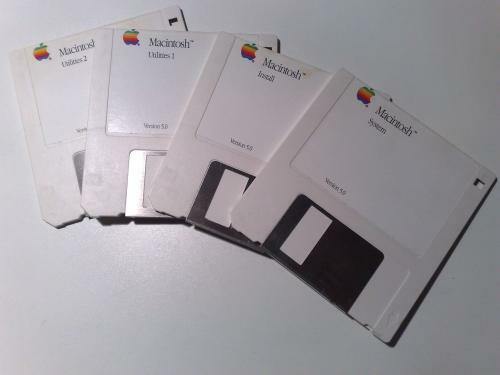 If anyone has any really old Mac abandonware (games, apps, OS etc that isn't in my collection) in floppy image formats please send them up so I can add them to the collection. Thanks and have fun! . mrpijey, What exactly is the difference between the OS 9.2.2 DVD and CD? The DVD is a multilanguage one. It contains installers for several localized versions of OS 9.2.2 I believe. Vista Ultimate R2, can you upload OS 5? I added 5.0 and 5.1 to the collection. But I would be happy to see if Vista Ultimate R2's version might be a different one.